UPDATED: One Nation leader Pauline Hanson has dismissed as “disgusting” media interest in her party’s alleged breaches of electoral disclosure laws, following the leaking of another recording of internal party discussions. 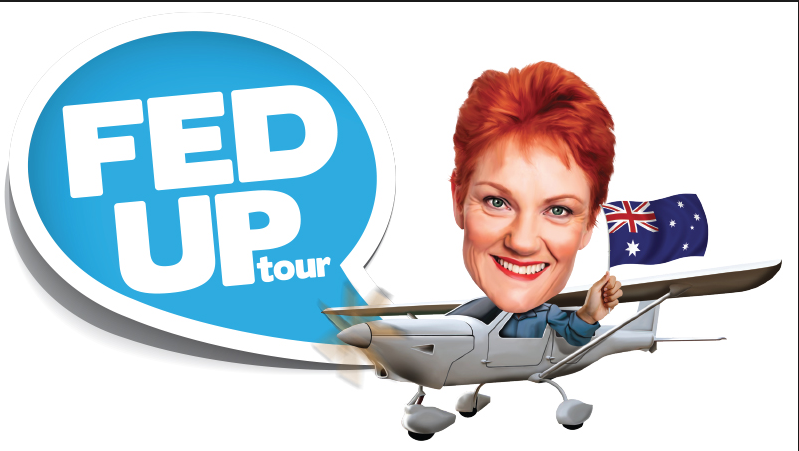 Pauline Hanson's plane, flown by adviser James Ashby, has been a prominent feature in One Nation campaign material. The Australian Electoral Commission is investigating whether One Nation has breached disclosure laws in relation to a Jabiru light aircraft used by Hanson. The Australian Federal Police, Electoral Commission of Queensland, Queensland police and Queensland Crime and Corruption Commission are also making inquiries into aspects of the party’s funding. Hanson indicates in a recorded conversation leaked to the media on Tuesday a Victorian property developer Bill McNee donated money to the party to cover a year’s rent on its Brisbane office and the plane. She goes on to say McNee’s identity was a tightly guarded secret within the party. “Who knows Bill’s name? No-one, we always kept it very, very quiet. Who knows that he paid the money up-front for the office?” she asks. Her chief of staff James Ashby has said the plane, which is registered and insured in his name, was bought by his Queensland company. Hanson says the leaking of the recording is a case of disgruntled former One Nation officials seeking revenge. Ashby told AAP he had complained to Queensland police about another leaked recording in which he suggested One Nation might make money by selling campaign material to candidates at inflated prices. “That’s a complaint I’ve made. I also know that other members within the One Nation party office have made complaints over secret recordings,” Ashby said, but would not name them. Labor senator Murray Watt says the latest recording showed Hanson had “something to hide”. “When will Senator Hanson start telling the truth about this plane? When will she start convincing us that she is actually complying with Australian electoral laws?” Watt said. One Nation senator Malcolm Roberts said his leader and Ashby were people of high integrity. “The slightest thing deviating from the truth she quickly corrects it – she is very strong on integrity and the same with James,” he told Sky News. Hanson says in the audio recording donations had been properly recorded with the AEC.